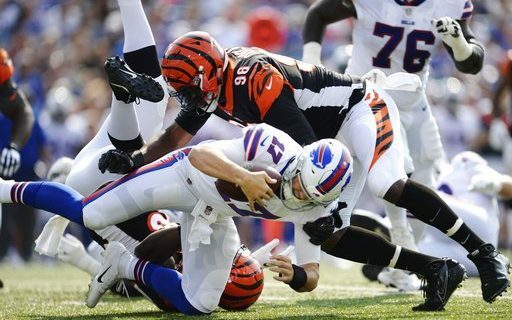 While my long-held belief that nothing that happens in the preseason really has much to do with what happens when the regular season begins, it’s hard not be very down on the Bills offense after what happened against Cincinnati. The Bills lost 26-13 after trailing 20-0 after the first half. In a game that was supposed to be Josh Allen’s coronation as the starter, the rookie QB and the entire offense took a big step back. I was convinced that the decision to start Allen this week was a precursor to him starting Week 1 against Baltimore. I’m not sure of that now. Allen looked like a rookie QB. Not all of that was his fault. The line was a disaster, and rarely gave Allen time to throw. He was hesitant to make throws, which likely had something to do with the receivers not getting open. But under that pressure from a very good Bengals defensive line, Allen looked panicky. I thought former Eagles and Browns executive Joe Banner summed it up best. I don’t entirely agree about the long season part, but it’s hard to be encouraged knowing the line looked that bad, lost it’s two best players, and didn’t do much to replace them. There really don’t appear to be a lot of other options. The starting five lineman (Dion Dawkins did not play Sunday) has been the same unit throughout training camp, save for the Bodine/Groy competition at center. So will this poor performance by the O-Line have a direct impact on the quarterback decision? I think it will, especially when you factor in the difficult first four opponents. *I was surprised that the Bills got away from the safe play-calling that was evident in the first two games. Now maybe the lack of blocking blew up those calls, but I didn’t see any quick throws or screens that would get Allen comfortable. He never needed that more that he did Sunday. *I found myself screaming “Throw the ball” on a few occasions when Allen hesitated. That’s bad memory from the E.J. Manuel years. Allen has to be more decisive. Yes, the pressure had a lot to do with that. But this is part of the learning process. He isn’t confident enough in the routes and reads that he’s not thinking for a split second. Against a good D-Line like Cincinnati, that split second is a sack. *All that said, there were a few throws that Allen made that made me scream “Wow.” The deep sideline ball that Kelvin Benjamin dropped was a great throw. The first pass, dropped by Charles Clay, was a laser that was a product of Allen’s adrenaline. *The Bengals defensive line is very good. Geno Atkins is one of the best defensive tackles in the NFL. Michael Johnson and Carlos Dunlap are long-armed, athletic ends. While they terrorized the Bills line, this was a good test and maybe one of the best tests of the year. I pointed this out in a story on Buffalo Sports Page a few years ago. *I know it’s just one play, but seeing Vlad Ducasse run over on the one sack was a sight I know I’ve seen before. I believe, and NFL people have told me, that Ducasse is nothing better than a backup. I’m not sure why the Bills believe he is more that that. *The good Bengals D-Line was out when Nathan Peterman came in. But he again showed the decisiveness that Allen was lacking. It’s the difference of a year in the NFL. I also think it’s what Peterman does best. He doesn’t have a great arm, so he’s compensated for it with quick decisions. *The FOX announcers kept saying that if the Bills decide they need experience at QB, they’ll go with A.J. McCarron. I don’t buy that. He’s started three games, one more than Peterman. Are they trying to tell me standing on the Bengals sideline for three more years than Peterman is a lot more experience? I don’t buy it. *I don’t want to get overly worked up about a third-string running back who will have minuscule impact on the season, but Marcus Murphy has been very good and I believe he’s a lock to make the team. *Another guy who made the team is TE Jason Croom. His touchdown catch is exactly what the Bills are looking for at the position. Now, will he make it over Nick O’Leary? That’s a tough call, but it would not surprise me. *After all the worrying about Tremaine Edmunds, he was great on Sunday with 7 tackles and two for loss. Great sign that he forgot about a tough game, studied and worked hard, and bounced back. His speed is tremendous and will be a force for the Bills defense. *I don’t know why everyone beats up Andy Dalton. He’s a real pro NFL QB. He made some great throws Sunday. He got the ball to his big weapon A.J. Green, and gave him a chance to make catches and gain yards. He’s not a top five QB. But he’s in the next group of ten. If he had a better team around him he’d win more and stop the negative talk. *Good for UB grad and Bengals tight end Mason Schreck. He has a tough road to make a Bengals team that’s loaded at tight end, but his three catches for 58 yards had to open some eyes around the league. He’s a classic flex tight end, and his speed is an asset. It was a good homecoming. I’ll have more on what this game means to the Bills quarterback situation later in the week.